Daylight saving time has recently ended and the holidays are around the corner, which means Black Friday 2018 and Small Business Saturday are quickly approaching. Determining the best Black Friday specials for your business can be tricky, especially when there is a holiday sale at almost every business nearby, but if you’re strategic, your small business marketing this holiday season can give you an edge. Look no further…here’s what you need to know about Black Friday 2018 to stand out among your competitors. There is an unspoken rule that Black Friday specials are only available early in the morning…that is so NOT true! Give your customers the chance to hit snooze on Black Friday 2018 by offering your holiday sale later in the day around noon or a little after. This bit of small business marketing serves to engender a little extra goodwill towards your company. Of course, if you do decide to change your store operating hours or delay the start of your Black Friday specials, make sure your customers are made aware far in advance. If you haven’t already, start promoting your holiday sale now. Gift cards are still the “go-to-gift” for many shoppers! They are easy to purchase and give the receiver an opportunity to find exactly what they have been looking for. Create a simple gift card for your business and include it as a part of your Black Friday specials. Tip: Make good use of your investment by incorporating gift cards into your small business marketing strategy and promotion. Having a hard time determining what Black Friday specials to offer? Simply analyze your top-selling products and small business services and the audiences that utilize them most. After your analysis, center your focus on promoting these products as best Black Friday specials and even include them in your Black Friday online deals. There is power in unity! 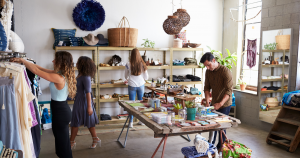 If the holidays have you and your team extra busy, consider partnering with other small businesses in the area to host a joint shopping extravaganza. The ultimate goal of this is to attract shoppers! The more shoppers you attract, the more sales your business will have in the long run. Keep your small business tax compliant with the help of TaxBandits’ simplified e-filing solution for IRS Form 941, 1099s, and W-2s. Learn more about our hassle-free tax compliance! Yeah, it’s stressful, but who said business owners can’t have fun for Black Friday 2018? Turn up the music, decorate, and give your shoppers a celebratory shopping experience that they will never forget! Social media is a small business’s best friend! Without it, many small business marketing techniques are null-in-void and have too little reach and too large an audience. Consider offering your social media followers a special offer during the holiday season. You can also increase social media engagement by offering a similar incentive to those that follow your social media channels during Black Friday online. Shoppers love discounts! Go the extra mile and be creative with unique exclusive discounts. Give discounts to local business owners, college students, senior citizens, and military personnel. Like we mentioned earlier, you don’t have to start your Black Friday 2018 holiday sale at the crack of dawn. 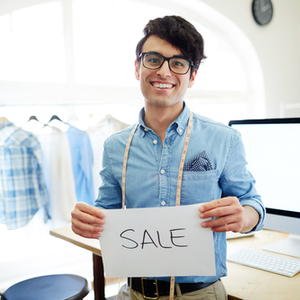 You can start and end your sale later than others to catch a larger crowd. Some shoppers can’t stand the daytime madness on Black Friday so your unique hours are ideal for them! There’s still time left to plan one of the best Black Friday sales in your area! Gather your team and even add a seasonal employee or two to brainstorm and implement the ideas that we have covered today. Be sure to keep receipts of sales and have accurate information on all of your current employees and new hires to provide 1099s, W2s, and Form 94x series returns at the January 31st deadline. TaxBandits provides a step-by-step e-filing process that allows you to instantly complete these returns hassle-free. Register today and keep your small business on the right track during holiday sales!